I am delighted with how 2018 has started for us with 5 winners and 5 seconds coming from a double handful of runners….. I hope the rest of the season continues with that kind of luck. We had a memorable across the card Saturday double two weekends ago when Hogan’s Height won his second novice chase from as many starts and Thebannerkingrebel bolted up at Warwick on his debut in a bumper. Hogan has been a thoroughly consistent horse all season and having been placed over hurdles and fences, he has put his effortless jumping to good use and under a positive ride from Richard Johnson he won well again at Wetherby. Meanwhile, the Jamie Snowden Racing Club had a day to remember at Warwick when Thebannerkingrebel destroyed a field of newcomers in the bumper there. Under a tactically brilliant Gavin Sheehan, Thebannerkingrebel lead them a merry dance and quickened up like a serious horse off the home turn and in Gavin’s words “he just kept quickening” and looks a serious prospect. The Champion Bumper at the Cheltenham Festival will now have to come under some serious discussion. 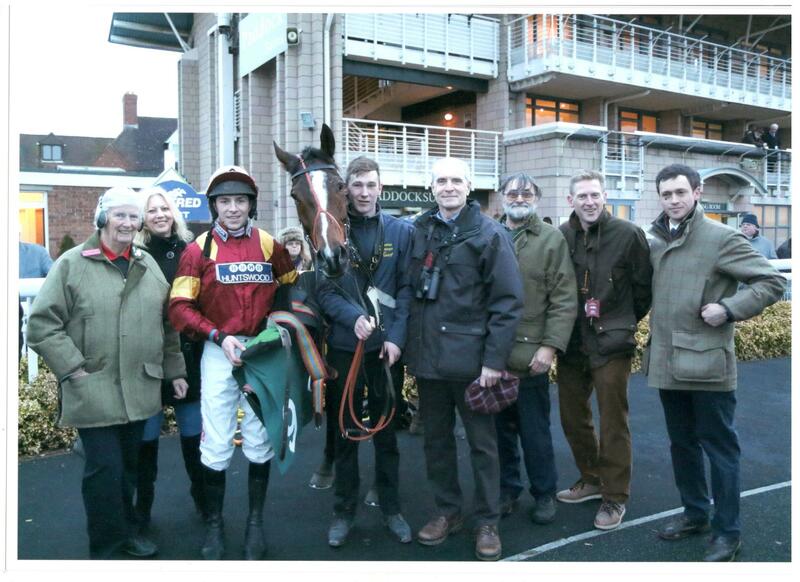 The JSRC enjoy a winner at Warwick. Lucy and I flew out on a week’s holiday that day so we watched the double from the air - it was quite surreal watching the racing on the plane drinking champagne, a lovely way to start a holiday! Anyway, I am thrilled to say that the winners didn’t stop there either, and with another double at Chepstow last Friday we are now one winner shy of our PB tally of winners for a season. Scorpion Sid looked mightily impressive on his debut under rules when romping away with a 2m4 novice hurdle. He had finished 2nd in an Irish Point, and we bought him at Ascot sales last spring. However, he had taken a while to come to hand, but he showed his true potential at Chepstow and we might think about stepping him up into a Grade 2 at Haydock in mid-February. He needs very soft ground so we’ll enter accordingly but as the cliché goes, whatever he achieves over hurdles will be a bonus as he is a proper old-fashioned chaser. Scorpion Sid bolts up on his rules debut. Naranja then followed up her Lingfield maiden win with a win on her handicap debut later on the card. She battled bravely and is now on the crest of a wave and I hope we might be able to pick up some black type with her over hurdles now. Naranja is the second leg of another January double. Of our other recent runners, Midnight Chill was a very good 2nd at Huntingdon and having picked up a mark of 122 I think he’ll go straight to the Grade 2 £75,000 EBF Final at Sandown on 10th March. Midnight Monty was 2nd at Market Rasen last week and that was a perfect prep race for those Military races at Sandown. Having won them as a jockey, I’ve hit the cross bar in them as a trainer, and I hope Monty can break my duck there. Lunar Flow continued his decent season with another fine 2nd at Wetherby on Tuesday, but he did flip his palate, so he’ll be off for a wind op this week. Meanwhile, Shockingtimes also hit the cross bar on the same day at Leicester. He put recent form figures of PFR behind him and I was delighted to pick up a number as opposed another letter, although he was unlucky not to win as he suffered interference after the last. There was a Stewards Enquiry, but the result stood. Oscar Star was 3rd under a penalty at Fakenham on Monday. She jumped the last in front but an error there proved costly and she couldn’t get back on terms. She is another that has just had her palate fired and will go for a Listed contest next time out. I am thrilled that we have been sent a couple of new horses over the last month as well. Timcoda is a 5yo gelding by Milan out of a half-sister to the great Champion French staying chaser, Mid Dancer. He was placed in three Irish Points, and is a cracking looking individual. We were unfortunately forced to retire Midnight Silver, but I am delighted to have bought Next Level for Foxtrot. He is a 7 yo gelding by Mahler from the family of Greenhope who won the Grand Annual at the Festival when I was at Nicky Henderson’s. Next Level won an Irish Point, but disappointed in novice hurdles for his last trainer. He has an appealing handicap mark and looks the type to rattle off a sequence.